A slightly-edited version of an article originally published under the title "How Hitler-era brown shirts took over Hunter College." Protesters at Hunter College seek to conflate local New York grievances with the Palestinian cause. The real point of the raucous protests around New York City university campuses this month was masked by demands for pay parity and free education so as to get students involved. Then came the anti-Semitism. This effort to tie legitimate economic grievances specific to New York City to Zionism is just the way Hitler's Brownshirts worked on Germans. Led by a screaming woman in hijab and a man, assisted by the usual outside agitators, students screamed themselves hoarse at Hunter College, a branch of City University of New York not far from where I live just a few days ago. "Zionism out of CUNY!" "Zionists out of CUNY!" "Intifada, Intifada" was chanted, screamed, roared, over and over again. You may see it here and here. This "million student march" throughout all of CUNY was endorsed by the Students for Justice in Palestine (SJP), a creation of the Muslim Brotherhood, a terrorist organization outlawed in Egypt; by their cells at Hunter College, the College of Staten Island (where I taught for nearly 30 years), John Jay College (where I taught for a semester), by the Law School at CUNY, and by St. Joseph's College and Pace College. The demand for "pay parity for adjunct professors" on the SJP Facebook page for the march is just and long overdue. Their demands for tuition-free education, the cancellation of all student debt, and a minimum wage of $15.00 for campus workers are, perhaps, more idealistic and economically challenging. However, their demands for an end to "racial and economic segregation in education," "racialized college-acceptance practices," "work program requirements for students on public assistance," and "the rapid gentrification and privatization of public school property" verge on the surreal and smack of Occupy Wall Street and the Ferguson riots. The Zionist administration invests in Israeli companies, companies that support the Israeli occupation, hosts birthright programs and study abroad programs in occupied Palestine, and reproduces settler-colonial ideology throughout CUNY through Zionist content of education. While CUNY aims to produce the next generation of professional Zionists, SJP (Student for Justice in Palestine) aims to change the university to fight for all people's liberation. What's Israel got to do with these domestic campus issues? Absolutely nothing—but in the mind of these Muslim Brotherhood-indoctrinated students it has come to symbolize every conceivable injustice, both real and imagined; it has come to justify the stabbing, bombing, and car-ramming of Jewish civilians everywhere, especially but not exclusively in Israel, as well as the anti-Israel boycotts undertaken by the EU and by American academic organizations. 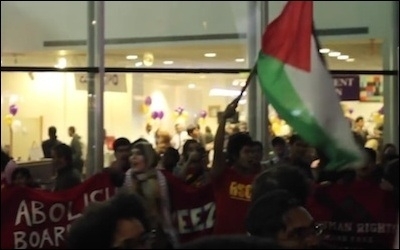 Students for Justice in Palestine should not be allowed to organize on American campuses. If there is intimidation, bullying and Blood Libels on campus it is anti-Semitism/anti-Zionism, not Islamophobia or anti-Arab-a-phobia, and it is coming from the Muslim Brotherhood-inspired Left; from Islamic-inspired and Christian liberation theology inspired Jew-hatred among angry African-Americans; from the anti-Zionist/anti-Semitic behaviors of the world's political leaders; and from the silence of our own professoriate—a silence which amounts to complicity as well as to cowardice. The Students for Justice in Palestine must be stopped. They are supported by a terrorist organization and have no place on an American campus. They are not a "club." They are Brownshirts on the move. Students who have been taught that is it permissible to shout speakers down, interrupt and heckle them, force out distinguished academics, compel payment for outside non-academic rabblerousers, feel empowered by totalitarian groupthink, conduct angry rallies like this one at Hunter College are no better than Hitler-era Brownshirts. They are not behaving like college students.